So I've officially started my bullet journal and I'm already loving it. 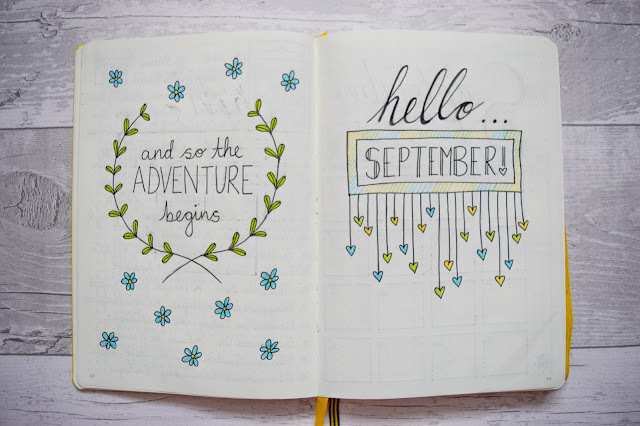 I realised that I started my Bullet Journal series a bit too late but nevertheless today I want to share with you my current set up for September. Being my first month of bullet journaling there are a few mistakes but nothing that I cannot learn from. 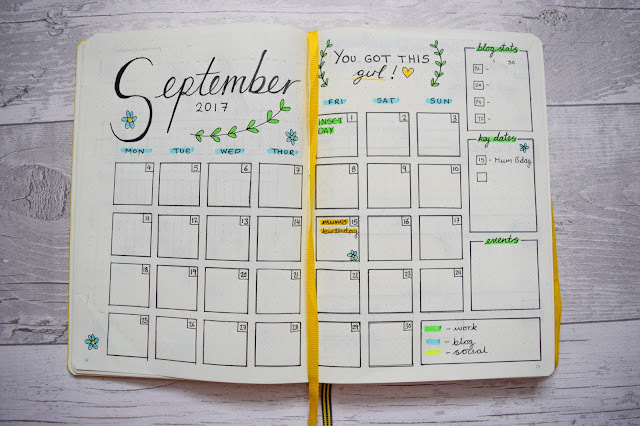 I hope you enjoy taking a peek at my September set up! 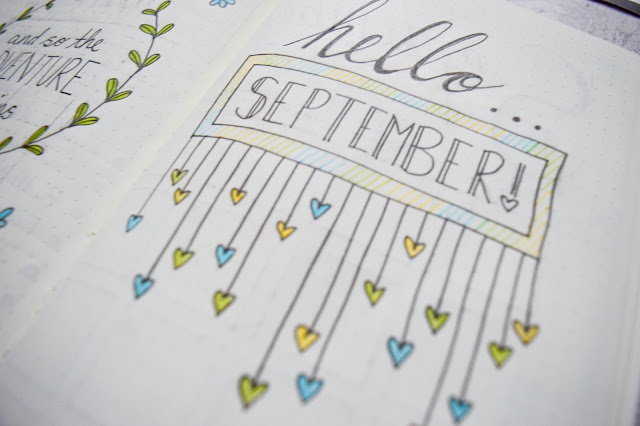 When I first started my September set up, I knew I wanted a two-page spread to welcome in the month. I was inspired by the ban.do agendas and I want to have quotes on these first pages that could represent the things happening that month. I'm starting my job officially this month in the career of my dreams so the quote "and so the adventure begins..." felt very suitable. I can't quite pinpoint why I picked the leafy and blue floral theme but I liked the colour combination and let it run through the entire month. This is my month overview page. I spread it over two pages in a classic design and I quite like it. 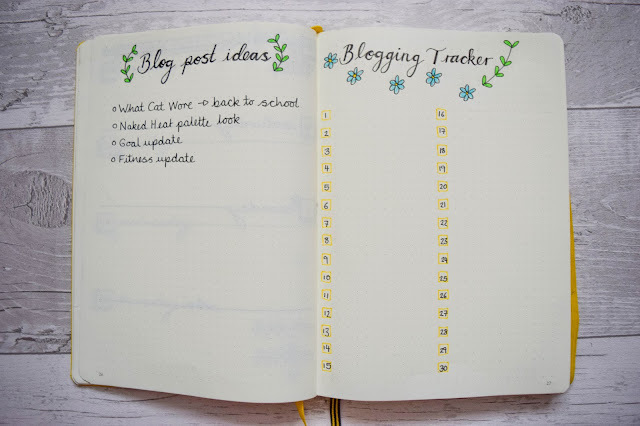 It gives space to write something in each day when needed and is easy on the eyes. I like how clean cut the boxes are in this layout but I think next month I'd like to try something a bit different to see if any other designs work best for me. I have a sort of sidebar too where I decided to have a space for blog stats, any key dates and events. I have some of these boxes nicely filled in now so it's already come to good use. I like my weekly overviews to start with Mondays because it's the beginning of my week. I know some people like it to be Sunday but for me, I like having the weekend altogether at the end of the page. It suits me best. 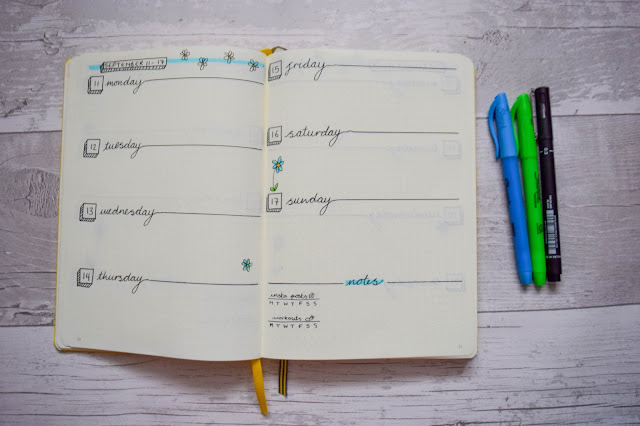 I set my weekly overviews quite classically too with the double page spread but now that I've done it, I'd like to try something different next month so it doesn't look like your usual diary, you know? I added some doodles to match the theme around the page and each page is different. I also added a notes part at the bottom for any extra things and two trackers to track when I post on Instagram and when I workout. 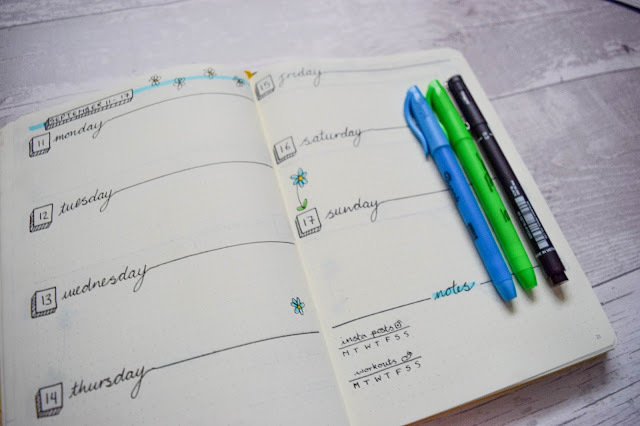 I felt that this would be a great way to track weekly. I wasn't sure about a monthly tracker but it is something I'm considering setting up for next month. 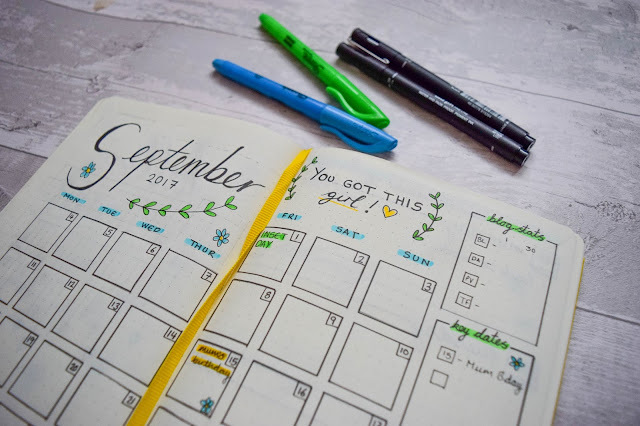 This month I am absolutely determined to not let my blogging slip. I've decided to have a double page spread for this and realised that maybe I should have put this at the beginning before the weekly overviews rather than at the end. 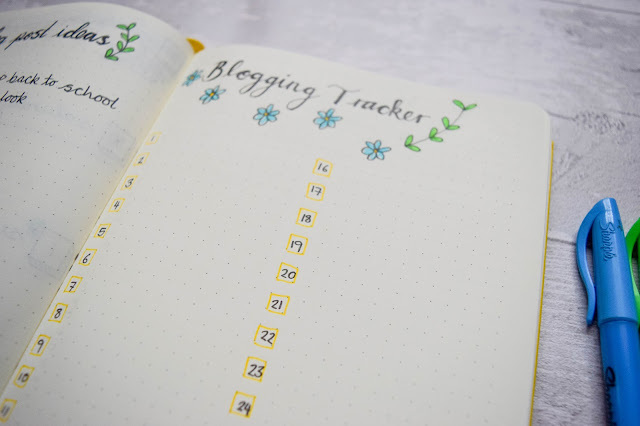 Anyway, here I put a blogging tracker to track when I post and what I've posted and also a space for ideas. I think it's pretty simple and self explanatory but I think again, like most of the other pages I'm not sure about this layout and would like to experiment with a different design. I've been very inspired by looking at other people's journals on Pinterest. I have a whole board to search up ideas and get inspired. You might like it too if you're bullet journaling so please be sure to check it out via the link! I'd love to know what your thoughts are on my journal so far. 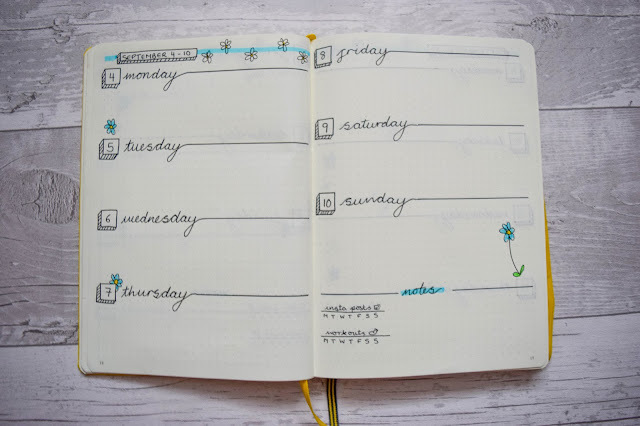 If you haven't seen, I also shared my initial bullet journal set up. What do you like but also what would you do differently? I've so fallen out of love with my bujo. I think university will hopefully get me back on track with it!